I'll have the Final Arguments posted tomorrow morning. Burton then asked Ryan if there had been a non-standard version of the AEBPR product that remained available on RegNow's website for a few days after the standard version of the AEBPR product had been removed. "Yes." Ryan said. "A discounted version for previous users of another product was still active." Burton asked Ryan to explain how that happened. "It was an oversight on our part." Ryan said. "We were all focusing on the email from Adobe which just mentioned the one product." Ryan went on to explain that the non-standard version of the product was also disabled as soon as Alexander Katalov contacted RegNow! to inform it of the situation. This segment follows this post. Defense Attorney Joseph Burton asked Ryan to explain about the exact dates and reasons for RegNow's removing ElcomSoft's AEBPR program for its website. "I received an email to one of our public email addresses from Adobe requesting that we deactivate one of our products." Ryan said, explaining that he forwarded the email to ElcomSoft and asked them for advisement on the matter. "And you took it down?" Burton asked. "Yes, we disabled that product." Ryan said. Next, prosecuting attorney Frewing began his cross-examination, showing Ryan a subpoena and some faxed documents of an email conversation he had participated in. Frewing confirmed with Ryan that it was a oversight on RegNow's part that the additional version of the AEBPR programs had not been removed from it's website at the same time the standard version had been removed. When the prosecution asked about RegNow's parent company Digital River and "all of its assets," Burton objected on relevance. Judge Whyte asked them approach the bench so Frewing could explain to the Judge where he was taking this line of questioning. "Is Digital River based in the United States?" Frewing asked. "No further questions." Frewing said. Now on to the Final Arguments! Here is the final segment of Alexander Katalov's testimony. Burton presented the same license agreement that Frewing had presented up on the screen. "Did ElcomSoft consult with a lawyer before using this license for your software?" Burton asked. Burton showed a more recent version of the same license agreement that had been modified slightly. "Did you consult with a lawyer?" Burton said. "No." Alexander replied. "I got it from the ASP (Association Software Professionals) website." Below is my account of the cross-examination of Alexander Katalov by the prosecuting attorney (U.S. Attorney Scott Frewing). 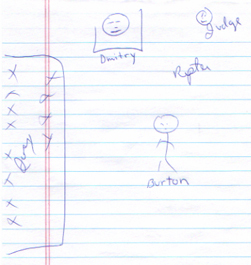 Also included below is the subsequent re-cross by Defense Attorney Joseph Burton. Frewing started off asking if ElcomSoft had ever experienced anyone using a stolen credit card to obtain a serial number for one of their software programs. Alexander said that yes, this has happened to ElcomSoft several times in the past. Frewing then presented a slide of the software license for ElcomSoft's AEBPR product and used a pointer to highlight the paragraph that says "protected by U.S. Copyright Law and International treaties." He made the point that ElcomSoft used this license to protect itself. You could tell where Frewing was going with this: ElcomSoft asserts that its software is protected by U.S. Copyright law and therefore should itself be bound by copyright law, right? Alexander wasn't disagreeing at all with the point Frewing was trying to make. "Most of our U.S. customers are large corporations." Alexander said. "So it's important." Frewing projected a screen shot of a webpage from the ElcomSoft website that had been taken on June 28, 2002. The text on the webpage explained that, "unfortunately, you can't buy the AEBPR program anymore." The text on the webpage also explained that the program could still be obtained from one of two other Russian-based (.ru) locations. Frewing then brought up the testimony of Special Agent Daniel J. O'Connell, who testified that, as of July 3, 2001, this text remained on the ElcomSoft website (with the links to the AEBPR software). Here's a link to the original complaint against Dmitry Sklyarov and Elcomsoft in which O'Connell describes the same investigation described by his live testimony. Alexander confirmed that "yes the text described by Special Agent O'Connell and shown in the screen shot was indeed what was displayed on the ElcomSoft website on July 3, 2001. That was it. Frewing had no further questions. Next, Defense Attorney Joseph Burton was allowed to re-cross. Burton thanked Alexander and he stepped down from the witness stand. Next up: my account of the testimony from a RegNow! employee. Here's more of my account of Alexander Katalov's testimony from last week's ElcomSoft trial. I'll be posting the rest of Alexander's questioning within the hour, and then my account of the testimony from a RegNow! employee. Then off to the final arguments! They should be up tomomrrow. Alexander explained how, on June 28, 2001, he received an email from RegNow! saying that they had been contacted by Adobe. The next day, Alexander sent an email to a RegNow! employee asking him to stop accepting money for the program. Burton projected an email on the screen in which RegNow! responds to his request. Burton read the text of the email out loud: "I am really sorry for any inconvenience. Please disable the AEBPR temporarily until we remove the feature Adobe doesn't like or find another solution." "Why did you stop selling the product?" Burton asked. "Why not wait until more complete information could be provided?" "To protect RegNow!." Alexander replied. "I decided that it would be better to pull the software first and then figure out the problem." Defense Attorney Joseph Burton is questioning defense witness Alexander Katalov. I am going to repeat the last few lines of the previous post to set the scene. "Was your company involved with Cox Broadcasting?" Burton asked. There was an objection from Frewing in here at some point on relevance, but the Judge overruled it and Burton was allowed to continue. "One of our employees had sent an email to remove our software from the site." Alexander said. Burton asked Alexander some questions about a series of emails between an ElcomSoft employee and Cox Broadcasting. Alexander explained that the email exchange involved a discussion of the Digital Millennium Copyright Act (DMCA). "My letter was rejected by Cox Broadcasting." Alexander said. "Since we were a company from Russia, there was no force of the law behind it." Burton submitted as evidence an email sent to Alexander from another ElcomSoft employee explaining that Cox Broadcasting had rejected ElcomSoft's request, asking "what can we do?" There was some discussion here about the employee going on to say (in the email to his boss at ElcomSoft) that he didn't understand American Law. Burton asked Alexander if ElcomSoft felt their rights had being violated by Cox Broadcasting and he said "Yes." Alexander went on to explain how, because they were only a small Russian software company against a big America company like Cox Broadcasting, the company couldn't really do much about it. Burton then changed the subject to whether or not ElcomSoft had in fact stop selling the AEBPR software. "Did you ever stop selling the AEBPR product?" Burton asked. 1) June 28, 2002 - Email sent to ElcomSoft from RegNow! Burton then asked Alexander another series of questions regarding the undisputed fact (both sides agree) that another non-standard version of the AEBPR software was somehow overlooked by RegNow! that remained available for purchase for 2-3 days before it was removed at the request of ElcomSoft. This non-standard version of the program was left up on the site until July 3, 2002. Once ElcomSoft was made aware that this other version was still available, it contacted RegNow! to had it removed from the site. Next up: the prosecution's cross-examination and the defense's re-cross. Okay. So, even though we all know how the trial came out yesterday, I'm still going to finish my account of the various testimonies and final arguments -- so you can understand better about where the Jury was coming from with their Not-guilty verdict. Later this week, I'll be interviewing Defense Attorney Joseph Burton about his experiences with the case. I had to take a bit of a breather yesterday after this last week's events. Sorry for the hold up on the rest of this stuff. Back soon. ElcomSoft Found Not Guilty On All Counts! By Joanna Glasner for Wired News. Russian software developer ElcomSoft has been cleared of charges that it illegally created a program to disable encryption on Adobe e-books. The verdict comes on its third day of deliberations. Jurors had asked to review several pieces of evidence, including a videotaped deposition of ElcomSoft programmer Dmitry Sklyarov, prior to reaching the decision. The jury verdict, announced Tuesday in U.S. District Court in San Jose, California, concludes the first criminal trial of a company accused of violating the Digital Millennium Copyright Act, a 1998 federal statute that protects copyrights on electronic content. Moscow-based ElcomSoft had been charged with violating the law by creating and selling a program called the Adobe eBook Processor, which allowed users to foil copyright protections put in place by e-book publishers. The government had charged the firm with four counts of violating the DMCA and one count of conspiracy. Assistant U.S. Attorney Scott Frewing maintained throughout the trial that ElcomSoft was aware it was violating the law by selling the Adobe eBook Processor. But defense attorney Joe Burton maintained that ElcomSoft's behavior shows that the company was clearly not aware it was doing anything illegal when it began selling the e-book decrypting program in June 2001. Burton asked jurors why the company would have sold and even written press releases about a program it knew broke the law. Here a bit more of my account of Alexander Katalov on the witness stand last week. More tomorrow! "Did you believe that it (the AEBPR program) was unlawful?" Burton asked. "No." Alexander said. "I still believe this program is legal." "What did you know about the DMCA in 2001?" Burton asked. "That it was an anti-piracy law." Alexander said. "I was happy that it existed because it would protect my software." This picks up where this post left off. Alexander explained how he thought Adobe was just trying to shut his website down as some kind of anti-competitive move, since Adobe knew that ElcomSoft's software wasn't truly illegal and didn't have any real legal grounds to sue. Adobe is requesting you cease the illegal actions by removing the offending materials. Please respond to us no later than five working days." -- 06/25/01 Letter sent to ElcomSoft from Adobe. Alexander explained that he understood the above wording to mean that he had a few days to fix the hosting situation and was planning to deal with Adobe after that. "Why was the software still available after getting this letter from Adobe?" Burton asked. "Because the letter didn't explain what was going on." Alexander said. "And I had other things to do, like trying to keep my business going." Alexander explained that the AEBPR program was a small product and not a particularly important product at the time to them, in the scope of all the other business they were doing. Having to deal with a relatively unexplained shutdown took up the majority of his attention at the time. I wish I had written down more of Alexander's explanation on this point verbatim, but here's the gist of the rest of it. Alexander woke up one day and found out his ISP was going to shut down his website and ask questions later. His first priority was to get his website back up (by finding another ISP). He didn't believe that the dispute with Adobe was going to be much of a problem. He was ready to do whatever was necessary to appease them, once he figured out what it was. Whatever it was, he thought it best to let it wait a day while he found another ISP and got his website and business back up and running. "One of our employees had sent an email to remove our software from their site." Alexander said. Alexander explained that the email exchange involved a discussion about the Digital Millennium Copyright Act (DMCA). "Since we were a company from Russia, there was no force of the law behind it." Alexander said. "And my letter was rejected by Cox Broadcasting. On to the next segment. I'm about to post another 500 words or so of my account of Alexander Katalov's testimony, and then that will be all till early am. Sorry that I didn't get more done today -- I got sucked into a vortex while helping to set up Tonight's Creative Commons Bash. Be back soon -- and then see you in the am! Here's the first part (of 2 or 3 total, I'm predicting) of my account of Alexander Katalov's testimony. Alexander explained how the Night Administrator for his company had called him on the telephone and woken him up about "a strange email from Adobe." Alexander went on to explain how his Night Administrator told him that the email sent to them from Adobe said that ElcomSoft had copyrighted material on its site. Alexander told the Night Administrator that he thought it was stupid to call him up in the middle of the night over it, and that they would work it out in the morning. The Night Administrator called him back again that night, this time at 3am. This time, it was Verio, ElcomSoft's ISP that was contacting the ElcomSoft, because they too had received a shutdown notice from Adobe over the same AEBPR product, except that the notice they sent to Verio says "within 24 hours". Verio is telling ElcomSoft at this point that they are about to shut their entire website down. Alexander tells his Night Administrator that it's 3:00 AM and he's really going to get it in the morning. That it's absolutely ridiculous that they are selling copyrighted Adobe software on their website, and that all of the confusion can be cleared up in the morning. Immediately after Vladimir Katalov testified, Alexander Katalov was called up to testify. Alexander is the older of the two brothers, at 39. He has short black hair, thinning on the top and he was wearing a black suit. Defense Attorney Joseph Burton asked Alexander his name and age, and about his position at ElcomSoft. "I am the President of Elcomsoft." Alexander said. "What is your role there?" Burton asked. "Marketing, tech support, hiring new employees..." Alexander named. "Sometimes I even work as a driver when I need to get things from one store to another." Alexander started to hold up his hands to drive an invisible steering wheel for a instant, before thinking better of the gesture and putting his hands back down. Alexander explained how ElcomSoft started in 1989-1990 when his country was still the Soviet Union. ElcomSoft formed with two partners (Alexander and Vladimir, his brother) at a time when citizens were just being allowed by the government to have private companies of their own. Alexander went on to explain more about ElcomSoft's early history, and how the company started in the supercomputer and payroll computers business, providing both hardware and software for their clients. Although many of these old products aren't sold anymore by the company, ElcomSoft continues to support these older systems for those clients still using them. "We closed that line in 1995-1996," Alexander explained. "But we continue to support our old customers." From 1995-1997, ElcomSoft focused on its software outsourcing business. Clients during this time period included VISA. In 1996, ElcomSoft starting selling shareware on the Internet. "How many employees were at your company at this time?" Burton asked. "Five to Seven." Alexander said. "What was your first product you sold on the Internet?" Burton asked. "Advanced Disk Catalog." Alexander said. Burton asked Alexander to explain how the creation of the Advanced Disk Catalog came about. Next, Burton asked Alexander when they started selling "password recovery" software. "1997." Alexander said. He went on to explain how one of their business partners sent them some financial information in an ecrypted format with a password that was supposed to be the partner's phone number. When Alexander received the file, the phone number wouldn't work. He tried the partner's business number, home number, and cell phone number, but nothing worked. Burton continued to ask Alexander about the company's history and more recent activities. Alexander explained that in 1997, ElcomSoft decided to start "downsizing its outsourcing business and concentrate on shareware and focus on password recovery software." "In 2000, what were the total sales of the company?" Burton asked. "$200,000 to $300,000." Alexander said. "And how many employees?" Burton asked. "Ten to twelve." Alexander said. "What were the total sales in 2001?" Burton asked. "In 2002? I know the year's not over yet, but..." Burton said. "Probably about the same: one million." Alexander said. Alexander said something about how the bad publicity had hurt their business this year and so they hadn't increased their business sales between 2001 and 2002. "How many employees do you currently have?" Burton asked. "Fifteen." Alexander replied. "And some part time employees that telecommute." Burton said that he wanted to talk about the AEBPR program now. "When did you first learn that there was a problem (with the AEBPR)? "Around midnight on June 25-26th." Alexander said. "Describe how you first learned about the problem." Burton said. "Where were you when this happened?" Burton asked. "In Russia. Moscow." Alexander said. Burton asked the Jury to please keep in mind that, in Moscow, where ElcomSoft has just received the letter for the first time, it was already midnight. This is significant because in Adobe's June 25, 2001 letter, it gives ElcomSoft five working days to respond. Since the letter was not received until midnight at the end of the first of day, to ElcomSoft, one of those five days had already passed before they even received the letter. I'm about to post the first in a two or three part segment of my account of Alexander Katalov's testimony, which I hope to complete by this afternoon. Then I still have my notes from the RegNow! employee witness to type up, and finally, my synopsis of the Final Arguments. Here's part two of my account of Vladimir Katalov on the witness stand. You'll notice that there are more links now within the text. I've decided to start integrating the various documents and evidence I've been collecting since last year (since July 17, 2001) about the dispute between Adobe and ElcomSoft. Where the documents are still available in their original location online, I link to them there, with a link my version as a backup. However, some of the emails and message board postings have been removed since last year, so I'm really glad I saved my own copies of them. I will sprinkle links to the evidence accordingly, as they come up. I'm also in the process of creating an "online evidence" page with everything itemized for easy reference. I'll also be going back to my earlier posts and adding links to evidence wherever they fit in. When I got to the courtroom at 8:30 am, Defense Attorney Joseph Burton had finished questioning Vladimir Katalov and the Prosecutor, U.S. Attorney Scott Frewing, was just starting his cross-examination. "You did some marketing?" Frewing asked. Frewing asked Vladimir a series of questions in order to establish some of the basic facts about the structure of ElcomSoft's online business. Frewing's questions gradually enabled Vladimir to explain how the actual content resides on the ElcomSoft website, although RegNow! handles the monetary transactions. Next, Frewing moved on to ElcomSoft's PDF password recovery software (The Advanced PDF Password Recovery program or APDFPR). "It doesn't really recover passwords, does it?" Frewing asked. "No. It doesn't really recover passwords." Vladimir agreed. What they are talking about is how ElcomSoft's "password recovery" products actually bypass the security altogether, rather than actually recovering a password is and providing it for the user to enter into the program to decrypt it. Frewing used Vladimir's testimony to establish how Vladimir had arranged for the promotion and selling of the AEBPR program. Frewing then asked Vladimir about his personal knowledge and understanding of the Digital Millennium Copyright Act (DMCA). According to Frewing, Adobe sent ElcomSoft a letter with some reference to the DMCA in September 2000 (10 months before the AEBPR e-book processor was released). Sorry, I don't have a copy of the September 2000 letter. "You said you looked at the statute?" Frewing asked, referring to the DMCA. "Not enough to understand it." Vladimir said. Vladimir tried to explain his position better, acknowledging that he did research the DMCA after receiving the letter in September 2000. "Do you understand it (the DMCA)?" Frewing asked. "I'm not sure, but I think I do." Vladimir replied. Frewing kept trying to establish that Vladimir had read the DMCA and understood it. Vladimir agreed that he had read it, but was pretty iffy on the "understood it" part. Vladimir was very adamant that, at that time (September 2000) he had thought that he understood it. However, when asked point blank if he now understands the DMCA, he could not seem to answer with complete certainty. Frewing mentioned that there's no mention of "Fair Use" on the ElcomSoft website. Vladimir replied that language about fair use was included some of the company's press releases. Frewing showed the Jury a marketing letter from ElcomSoft on the big screen and made the point that the AEBPR software was marketed as "a tool to decrypt ebooks." Frewing made the point that Vladimir didn't post the information to bugtraq, and Vladimir brought up that he wasn't a technician and wouldn't be the one to post information like that to a buglist anyway. Despite Vladimir's comment above, for whatever reason, over a year after this dispute began with Adobe, on July 12, 2002, Vladimir posted to bugtraq about the AEBPR program. (If you have trouble accessing the bugtraq site, here's my own HTML version of the post .) Frewing ended his questions by bringing up this fairly recent bugtraq post. "After you had already sold the (AEBPR) program, you posted to bugtraq?" Frewing asked. "After you knew the FBI was involved?" Frewing asked. Coming up next, ElcomSoft President Alexander Katalov takes the stand. I'll be keeping these installments coming over the course of the day. Next installment - the Prosecution's cross on Vladimir Katalov, Alexander Katalov's testimony and the testimony from the RegNow! employee (Today - Saturday). The Final Arguments Synopsis will go up tomorrow (Sunday) afternoon sometime. The segment follows this post. I will be referring to Vladimir Katalov and Alexander Katalov by their first names or complete names only, so it won't get too confusing in case if you are reading all of these segments at once. Burton asked Vladimir a few basic questions about himself. Vladimir explained that he was 33 years old and that he lived in Moscow. "Are you currently employed by ElcomSoft?" Burton asked. "Yes. I have worked for them for more than 10 years." Vladimir replied. "What is your title there?" Burton asked. "I am the Managing Director." Vladimir said. Burton displayed a screenshot from the ElcomSoft website and pointed to the list of file types on the page. "What other file types (besides EBook and PDF) do you sell password recovery programs for?" Burton asked. "Word Perfect, Microsoft Publisher, other Microsoft software..." Vladimir said. "There are others." Yeah, I'd say so! more than just a few. "How many password recovery programs..." Burton started to say when the prosecuting attorney, U.S. Attorney General Scott Frewing, objected. Judge Whyte overruled the objection. It seemed like Frewing was trying to down play a couple different assertions that had been made by the Defense during Dmitry's testimony: 1) That the AEPBR program is just another in a long line of "password recovery" programs that ElcomSoft has been offering on the internet for years. 2) That the APDFPR and the AEBPR programs are essentially the same programs with different security handlers. "Do you sell your software in Russia?" Burton asked. "Yes." Vladimir said. "We sell it on the Internet to all countries." "Are there customers of your software that are in law enforcement?" Burton asked. "Can you give me an example of a customer?" Burton asked. "Police Departments, FBI, IRS." Vladimir said. "Police Departments, the FBI and the IRS are customers of yours?" Burton asked. "Yes. They are purchasers of our programs." Vladimir said. "Is the U.S. Department of Justice a customer?" Burton asked. "Yes. We receive orders from them about once a month from different states." Vladimir replied. "Are there state agencies that are customers of your software?" Burton asked. "Do District Attorneys purchase your products?" Burton asked. "Are there private companies?" Burton asked. "Yes." Vladimir replied. "Adobe, Microsoft, Motorola, Siemens..."
"Adobe is one of your customers?" Burton asked, emphasizing Adobe ever so slightly as he said it. Burton then asked Vladimir some questions about how the AEBPR program was marketed, and about how it was reviewed in PC Magazine and in some books. Burton then asked Vladimir about ElcomSoft's conference schedule in 2001. "Did you attend any conferences in 2001?" Burton asked. "Yes. Two." Vladimir said. "The Techno-Security Law Enforcement conference, which we were a sponsor of, and DefCon." "So a Law Enforcement conference and a Hacker conference?" Burton asked. "Yes." Vladimir replied. "We were a sponsor of the Techno Security Law Enforcement Conference. We had a booth." Burton showed Vladimir, and then the Jury, two exhibits. "Did individuals from Law Enforcement visit your booth?" Burton asked. "Yes." Vladimir replied. "They asked questions..."
"Was one of the products that you were demonstrating in the booth the AEBPR program?" Burton asked. "Did those members of law enforcement give you their business cards?" Burton asked. He passed around to the Jury the business cards of law enforcement individuals that had been given to ElcomSoft while they were visiting the ElcomSoft booth at the Techno-Security conference. "When was the date of the Techno Security Conference?" Burton asked. This date is very significant in that it is more than three months earlier than when the trouble with Adobe started (in late June). (That is, three months before Adobe sent their first correspondence to ElcomSoft and the first correspondence to ElcomSoft's ISP (Verio) about the AEBPR program.) This seems to make a strong case for ElcomSoft's assertion that it was under the impression that its software was perfectly legal, considering they were openly demonstrating it to members of the Law Enforcement community at such high profile Law Enforcement Technology and Security Conferences. "Are there any competitors in this business?" Burton asked. "Companies who make products similar to yours?" Burton asked. "Yes." Vladimir said. "There are at least four companies with programs that do about the same thing." "Do those companies still exist today?" Burton asked. The Prosecution objected twice while this line of questioning was going on, but was the Judge overruled the objections both times. "Did Adobe purchase the program before July?" Burton asked. "Yes." Vladimir said. "I believe in February or March." Court adjourned for the day at this point. Next installment - the Prosecution's cross on Vladimir Katalov, Alexander Katalov's testimony and the testimony from the RegNow! employee. The Jury is taking the weekend and Monday to consider the evidence further. I'm going to blog a Wired News story about it in a second. I've had a power outage the last few hours, so I was unable to post my latest ElcomSoft Trial update, which I will post in a minute. I've decided to go through this stuff in the order that it took place, rather than jumping ahead and discussing the Final Arguments. If I'm lucky, the Jury won't come up with a decision till Monday, and I can string you along all weekend as I catch up on my notes up until the end of the Final Arguments. And then we can all hear the verdict on Monday morning and it will all be so dramatic. I also hope that the Jury is really thinking about these issues, and is taking as much time necessary before hopefully coming to the right decision. So here's the rest of Dmitry Sklyarov's testimony, and then I'll move on to the other witnesses for the Defense (Vladimir Katalov, Alexander Katalov and an employee from RegNow!). Defense Attorney Joseph Burton is wrapping up his rebuttal after the Prosecution has cross-examined Sklyarov. "You were asked (by the prosecution) why you didn't make a program that only makes one backup copy. Is it technically feasible to make such a program?" Burton said. "I supposed its technically feasible." Dmitry said. "But it doesn't make sense." Next Burton addressed whatever the Government was trying to get at earlier when he asked Dmitry if telling the truth was a condition of his government agreement. This reminds me that I forgot to mention earlier that Frewing had sort of implied that Dmitry might not be telling the truth when he cross-examined him earlier. He casually reminded Dmitry that if he didn't tell the truth, he would be nullifying his agreement with the government. "With respect to the agreement with the government and your telling the truth." Burton said. "Who will ultimately decide if you are telling the truth?" "I decide to tell the truth everyday." Dmitry said. "I tell the truth everyday." Dmitry was confused by the question. And actually, we all were. You could tell from the looks on the audiences faces. Burton tried again. "Who will decide if you have told the truth today?" Burton asked. "Most probably, U.S. Government..." Dmitry sort of half said and half asked. "Did you use the Adobe specification?" (When developing the AEBPR program.) Burton asked. "No further questions," said Burton. That was it for Dmitry. Next: Vladimir Katalov takes the stand. ElcomSoft On Trial: Dmitry's Cross-Examination By The Prosecution Here's my next round of notes from the ElcomSoft trial. I haven't heard anything yet about a decision from the Jury. You'll know as soon as I do! "If I was an unscrupulous student, would I be able to use the AEBPR program to make copies (of the course materials) and give them to the other members of the class?" "Yes." Dmitry replied. "But it would be illegal to distribute them. You would be distributing them yourself. The program doesn't do it." Dmitry volunteered that an unscrupulous student could also open up the Ebook and take screen grabs of its pages and distribute them, or even print the pages out and make copies of them, and distribute those, illegally, to everyone in the class, if one were so inclined. Frewing made a point of having Dmitry clarify that it would probably be cheaper and take less time for the unscrupulous student to spend the $99 on the AEBPR program and email them to do students from his home than to perform any of the other options Dmitry had mentioned. "Yes." Dmitry conceded. "It might be cheaper." This is just a little informational post to let those interested know that I just got back from the last day of the trial and I'll have a brief synopsis of the day's events up soon (within the hour) before getting back to finishing up my extended coverage. The Jury is planning to deliberate today and tomorrow morning -- so we might have a verdict before I "get there" with my narrative account of it -- but I'm trying to catch up! Next update late tonight or early am. Juicy stuff! Then I will go back and finish the long versions of the witness cross-examinations. Promise. I'm hoping to get another installment up tonight...but it might not be till early morning. The final argument is in San Jose at 8:00 am, so it's most likely I'll be posting well into the weekend on this thing. Hopefully the Jury will take its time deliberating on the evidence and not make any hasty decisions on Thursday afternoon. I'll keep you posted. "I still believe that it is absolutely legal," he said. "I'd like to rephrase the question. When you developed the program, you thought it was lawful. Correct?" Burton asked. "And up until July 16, 2001, you thought it was lawful?" Burton asked. "What were the reasons you thought it was lawful?" Burton asked. "The initial idea was taken from the Internet. It had been around for years," Dmitry said. "Between the time you developed the program and July 16, 2001, did anyone ever tell you that the AEBPR was unlawful?" Burton asked. My comments/attempts at humor are in italics so as not to be confused with the often amusing real life events. It's still Monday afternoon, December 9, 2002 and Dmitry is on the witness stand. "It's called..." he struggled to remember the right words, and then his eyes widened as he finally remembered, looked at the audience and said, "Fair Use." Suddenly, thunder struck and lightening flashed wildly inside the court room. The Judge told the court reporter to strike the thunder and lightning from the record and immediately instructed the Jury to please disregard any implied statements made by the deity or supernatural forces that may have caused the thunder and lightning to occur when making their deliberations. As soon as the issue of whether or not ElcomSoft's AEBPR program violated the law entered the picture, Judge Whyte quickly jumped in. He explained to the Jury that Dmitry's understanding of what was legal or not legal should only be considered regarding whether or not he acted willfully when doing something. He explained again that it should only be considered with regard to his state of mind -- and that it was not being offered regarding whether or not the program actually violated the law. After the Jury had nodded -- and seemed to have all looked the Judge in the eye to acknowledge that they understood what he had said -- Dmitry was allowed to continue. Dmitry went on to explain how the program can only be made to work with legally-obtained ebooks. And how it worked by accessing the protected document and creating an unprotected copy. "What was your intended use of the program?" Burton asked. "To allow people who legally own some ebooks to read them on a computer -- any computer they like. Also, it is a demonstration of the weaknesses of PDF security," Dmitry said. The members of the Jury were all taking feverish notes at this point. "Was it your intent to violate anyone's rights?" Burton asked. "No further questions." Burton said. Next came the prosecution's cross-examination by U.S. Attorney Scott Frewing. Frewing asked whether Dmitry had communicated with his lawyers before coming to the trial today, which of course, he had. It seemed as if Frewing was trying to make it somehow suspicious for Dmitry to be communicating with his lawyers. Frewing then asked if Dmitry knew that the government had wished to question him earlier, prior to his appearance in the court room today. He said that no, actually, he hadn't known that until his counsel had told him earlier that day. "Do you know that your lawyers declined for you on your behalf?" Frewing asked. "Yes. I was told today." Dmitry said. Note: Frewing liked to make what sound like statements of fact, rather than questions when he asked his questions. He seemed to expect the witness to say "yes" if they agreed, but he didn't give his voice the right inflection like he was asking a question, and seemed a little nervous, resulting in him sounding a little stiffer still, and confusing things more. So every witness got a bit confused at first until they understood what his style was. Frewing also spoke very fast (as he admitted himself, and cordially apologized for several times). So the strange inflection combined with the language barrier led to a bit of confusion at first, and every Russian-speaking witness had to ask him to please slow down. After he slowed down, and the witness got the gist of his questioning style, and that they were supposed to say if they agreed or not with his assumptions. Then the questioning went relatively smoothly. "You testified that it (AEBPR) could be used for a bad purpose?" Frewing asked. "And you knew that when you were designing the product, that [it could be used for something bad] (or something like that)?" Frewing asked. Frewing asked Dmitry to explain how ebook protections work, and how the ebooks protected by security technologies will make it so that copies of the ebook files to be non-functional. "The AEBPR program removes all such protections?" Frewing asked. "You didn't design it to make only one additional protected copy?" Frewing asked (referring to usage that Dmitry had cited earlier of making a back-up copy of a legally purchased ebook an ebook for the purposes of using it on a machine running the operating system of the purchaser's choosing). "No. Because the copy is the same as the original copy." Dmitry said. "You didn't design it so only sight-impaired people could use it." Frewing asked. He then questioned him about why he didn't submit the security info to Adobe's bug tracking system. This seemed like is a pretty ironic line of questioning considering that 1) Adobe's security flaws were way to extensive to be considered "bugs" and 2) ElcomSoft could have potentially been subjected to additional prosecution under the DMCA for making such knowledge public, had they done so -- making it pretty strange that the prosecution was scolding them for not making the information public. "You didn't submit the bug to bugtraq, but instead, you wrote a program for ElcomSoft?" Frewing asked. "And they sold the program?" Frewing asked. Here's my next installment from the ElcomSoft trial. My next post will be tomorrow in the AM. "One of the things you were trying to do was to demonstrate weaknesses?" said Burton. "Yes," replied Sklyarov. "Many companies say the Ebooks are copyproofed. But most of the ones I have seen are not secure and can be easily compromised. The program I developed demonstrates such security flaws." "We are trying to show that E-book distribution on Adobe's Technology is insecure," he said. "We are not trying to hurt publishers." "By 'publishers', who do you mean?" said Burton. "I mean copyright holders," Sklyarov said. "Companies that use those (security technologies) can lose money, and that's not fair," said Sklyarov. "The public has a right to know." When we last left our story, our hero (Dmitry Sklyarov) is being questioned on the witness stand by ElcomSoft defense attorney Joseph Burton (perhaps the real hero), as a video excerpt of Dmitry's July 2001 Def Con presentation is being presented to the Jury. During the course of the videotaped presentation, Dmitry demonstrated the AEBPR e-book reader and how it worked. "There is no security at all," he says on the tape. The video audience appears to be very impressed and claps accordingly. After the video, in the real live courtroom, Dmitry explained his intentions in writing the AEBPR ebook reader program. "Now you can transfer your e-book to your laptop," he said. He also explained how it was just a demonstration program, only capable of creating a single PDF format copy of an encrypted e-book "one book at a time." The discussion then focused on price -- why sell it instead of give it away? "Why didn't you post the information showing the security flaws to the internet?" said Burton. Dmitry explained the reasoning behind pricing the software at $99, rather than giving it away free, because that could "hurt publishers," and that his goal was to provide "just a demonstration." "Did you participate in choosing the price?" said Burton. "Yes," said Sklyarov. "As I understand it, making the price below $99 or free would hurt publishers. The price was high enough that it was more than the cost of an ebook." Then the line of questioning shifted to the construction of the APDFPR and AEBPR programs and the alleged deconstruction of the Adobe E-book reader that Elcomsoft may have used in order to create its own ebook reader (later, upon cross-examination by the prosecution). The defense had prepared a chart detailing the smaller components that make up ElcomSoft's APDFPR (Advanced PDF Password Recovery program) and AEBPR (Advanced E Book Password Recovery program). At this point the prosecution had an objection of some sort [I believe it had to do with the prosecution wanting to only focus on the ebook program (AEBPR) rather than the other password recovery program (APDFPR)] and the Judge asked for counsel to approach the bench. That took a good minute or two, and I noticed Dmitry smiling at the jury as he sort of inspected them. Finally, both sides appeared satisfied and the trial moved onward. The Judge allowed the defense to continue with its original line of technical discussion, after rephrasing the question slightly. They went over the different parts of the program: User Interface, Program Protection, Registration, Kernel and Security Handlers. It was then that I began to feel the watchful eyes of our attentive jurors start to glaze over just a little. "Are there different kinds of security handlers?" Burton asked. "Yes," said Dmitry. He then went on to discuss the different kinds of security handlers such as "file-open." Burton then went on to establish that the two programs were created from the same kernel with modifications to the user interface and the addition of extra security handlers. Dmitry mentioned a number of the handlers by name, including: ROT 13, Adobe PDF Merchant Security Handler, EBX -- Electronic Books Exchange (what was initially Glassbook, which was bought by Adobe and implemented in its Ebook reader), and support for generic document handlers. Burton asked Dmitry a series of questions to establish to what extent the code base in question was Dmitry's handiwork. Dmitry explained that he wrote the entire kernel and that the kernel consisted of about 60-70% of the ebook reader code. The point was made that besides the user interface and security handler differences, there was no difference between the APDFPR and the AEBPR programs. Tip, re: Keeping APDFPR and AEBPR straight: I finally figured out that these are the same initials except for a "PDF" or an "EB" (for ebook) in the middle. Once you think of them as "A" (advanced) (insert file format here) PR (password recovery)", they don't seem so complicated. Stay tuned for the next episode, when Dmitry says the "F" word on the witness stand! Court wrapped up early today. Both sides have presented all of their evidence and examined and cross-examined each other's witnesses. Tomorrow will be a day off to let the Judge finalize the Jury instructions (which the Judge explained could not be prepared properly until all of the evidence was heard) and to let both sides prepare for their final arguments, which will be taking place Thursday morning at 8:00 am. I expect to be writing up yesterday and today's events for the next 24 hours or so. I'll keep posting them here in 1,000 word incriments. Here's a little courtroom artwork to tide you over till the next one. That's the "Jury" on the left and "Reporter" (meaning the court reporter) on the right. I had a really interesting day in court Monday observing the U.S. vs. ElcomSoft trial. Dmitry Sklyarov was cross-examined by both sides and Vladimir Katalov had just taken the stand for a bit when it was time for court to adjourn. I'll be posting more this evening before heading over to the big EFF party tonight. All in all I'd say the Jury was probably just trying to keep up with the conversation more than anything else -- which did get rather confusing from time to time in the context of all of the products, technologies and acronyms flying around. Even I had to look at the big chart provided by the defense showing the two products being discussed side by side -- the APDFPR (Adobe PDF Password Recovery program) and AEBPR (Adobe Ebook Password Recovery program) -- every so often in order to keep it clear in my mind which one they were talking about as they switched back and forth. And I've been familiar with the case for over a year -- so I can't imagine what it would be like for a juror to try to stomach all of this stuff in a couple of sittings. One thing about the jury though: they sure looked interested in what was going on. They were paying close attention and were taking everything very seriously -- yet they were also quick to laugh when things were, well, just plain funny. I'd like to apologize ahead of time for what is undoubtedly going to be a stream of consciousness style of writing for these notes. I'm trying to write all of this up while it's fresh in mind so I don't fall into the trap I've been in for the last few weeks trying to reconstruct what happened from my notes at Eldred. The whole point of my taking entire week to observe this trial, besides the obviously selfish reasons of wanting to experience history in the making and all that kind of stuff, was to bring the experience to those who couldn't be there. With that in mind, it only seemed fair to enable you to share the experience with me in a timely manner -- and while you're interest is up! Please do let me know if any of this needs further clarification. It is my intention to eventually have an online account of the trial that is linked to all of the evidence (most of which is already available online in some form or another) so that a reader can follow along and consider all of the evidence presented for and against etc., and try to understand the thought process of everyone involved as the events were taking place. I believe it is important to have a historical account of this case because, much like the Eldred case, I believe that its outcome will greatly change the course of history. It was Dmitry Sklyarov's arrest in July of 2001 that got me interested in Copyright Law and the DMCA in the first place. I cared very little about either until I learned that a Russian graduate student had been arrested and was still being held without bail (only for a few days originally -- but eventually he was held for over three weeks in jail and then not allowed to return home for almost six months!) -- and all because a software company alleged that some software his employer had developed could have potentially infringing uses. It didn't seem possible. I began researching this strange "DMCA" law the technological and legal issues involved, and learned that the plot only thickened with more information I obtained. Webcasting issues became involved, and ultimately, free speech and the public domain seemed the most at risk. I continued with my research, and decided to move back to the SF Bay Area to see if I could be of any assistance to anyone trying to help the situation. Five months later, I was working for Lawrence Lessig at Creative Commons. One thing I know for sure -- for me, none of it would have transpired as it did were it not for Dmitry's arrest. For this reason, and the reasons mentioned earlier, I wanted to be there to experience this trial for myself. I counted only 21 people in the audience of the small courtroom in downtown San Jose, California. Burton played a twelve minute video excerpt from Dmitry's July, 2001 (exact date here) presentation at the Def Con conference in Las Vegas, Nevada. The tape was played on a TV set placed between the witness stand where Dmitry sat and the jury box. The jurors sat with 4 in front and 8 in the back row, and all of them had note pads that they were all keeping pretty busy with. Anyway, it was pretty funny -- and everyone in the court room laughed loudly. It also served to loosen things up a bit. The video clip itself was also kind of funny because it had this really Tron-like sort of outdated pseudo-flashy opening but then the footage of the presentation itself was very amateurish and low tech. Dmitry was sitting at a table up on stage with a microphone in front of him and two or three other people at the table next to him without microphones. It was very bright in the room and it looked warm. Too warm. Like, Las Vegas in July warm. After the "talk like Checkov for us" incident, Dmitry went on with his presentation. It seemed like he was shouting into the microphone, but I couldn't tell if it was just turned up too loud at the even itself or if perhaps whoever recorded the video had blown out the levels when they recorded the tape. Dmitry seemed to be reading from his pre-written speech for the most part. Okay it's midnight and I've got to get some sleep before court tomorrow. But I will say that I've somehow managed to write over 1,000 words already, although I've only gone through one page of the thirty or so pages of notes I took today. So suffice to say that there's a lot more where this came from. More tomorrow afternoon -- court gets out at noon and I'm going to the EFF party at 7pm, so I'll post as much as I can in-between.